Tejas, the smallest lightweight, multi-role, single-engine tactical fighter aircraft in the world, is being developed as a single-seat fighter aircraft for the Indian Air Force and also as a two-seat training aircraft. 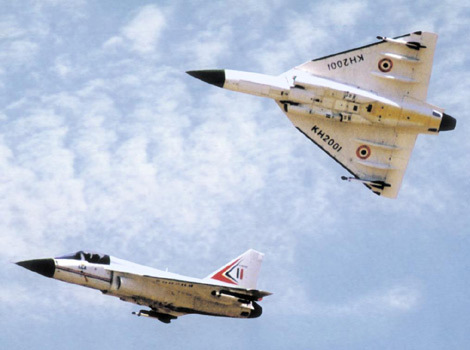 It is estimated that the Indian Air Force will have a total requirement of about 200 single-seat Tejas fighter aircraft and 20 two-seat Tejas trainers. The maiden flight of the first Tejas Demonstrator I was in January 2001.In April 2006 production of 20 Tejas was approved by the Indian government.In April 2007 the first production aircraft had its maiden flight.Tejas is planned to achieve initial operating capability (IOC) in 2008 and enter service in 2011.
can you give indonesia your technology? ITZ MY DREAM TO BECOME A PILOT OF INDIAN ARMY!!!!!! !I AM JUST 18 YEARS OLD!